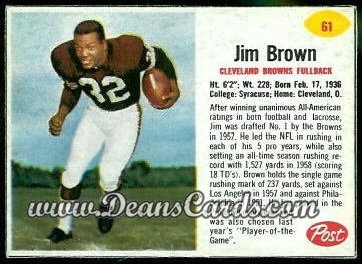 Here at DeansCards.com, one of our most popular sets is the 1962 Post football card set. Collectors remember these cards being printed on the backs of their favorite cereal boxes when they were kids. The Post Cereal Company printed these cards, which were supposed to measure 2½” by 3½”, to be cut out of the box manually. Very few of these cards exist in nice condition because young children were usually the ones doing the cutting. Unlike baseball, which had a three year run on both Post cereal and Jell-O cards, there was only one set released for football. The set consists of 200 cards total, organized by team and then alphabetically by player last name. The teams were organized by the order in which they finished in 1961. The Green Bay Packers, who finished 11-3 and went on to win the NFL Championship, start the set. The Washington Redskins finished 1-12 and are last. Post also released booklets about how to play offense or defense. These were give-aways that could be acquired from grocery stores by purchasing Post cereal products, Gravy Train dog food, or Duncan Hines cake mixes. The most expensive card that we currently have in stock is # 10 Tom Moore, the Packers running back who would be selected for the Pro Bowl in 1962. The first card of the set, # 1 Dan Currie, a linebacker for the Packers, is the best selling card. Post also released a Canadian Football League set in 1962. These cards feature players from the Argonauts, Eskimos, Alouettes, Rough Riders, and Stampeders teams and include a French translation of their English biographies. 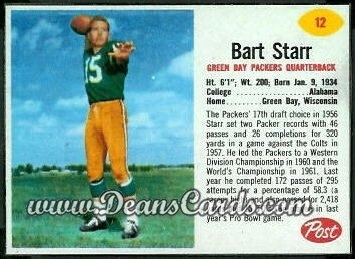 DeansCards.com has yet to come across CFL Post football cards, but we are always looking for collections including these unique cards. We do have hundreds of Post cards online and ready to buy. I am sure you meant to say that the Packers won the NFL Championship not the Super Bowl in 1962. The Super Bowl was still a few years from reality. The Post cards reminded me of a set of cards that came out in the 60's I believe on Wheaties boxes that had multiple sports. I had a few including the George Mikan. Just a random thought!